While the City of San Francisco’s budget has increased by $937 million this year alone*, allocations to fund arts and culture in San Francisco have stayed relatively flat. This lack of investment in our arts infrastructure has endangered the unique and vibrant cultures that helps attract visitors to our City who annually contribute approximately $1.7 billion to San Francisco’s economy. A group of arts organizations, artists and community activists have worked with the Board of Supervisors, the Mayor’s office and other City officials to create Prop E that will address this deficiency in funding for arts and culture organizations in a sustainable and fiscally responsible way. Create an Arts Impact Endowment to address unmet needs within our arts community. For more information on Prop E and to learn how to get involved, please visit www.artsforeveryonesf.com. Download a PDF to share with your San Francisco constituents here. 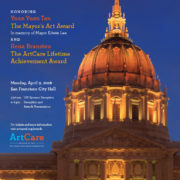 ArtCare hosted an awards benefit at San Francisco City Hall on Monday, April 9 to honor the 2018 Mayor’s Art Award recipient, Yuan Yuan Tan, and the ArtCare Lifetime Achievement Award recipient, Rena Bransten. The Mayor’s Art Award was presented by Anita Lee, the late Mayor Edwin M. Lee’s wife and JD Beltran, President of the San Francisco Arts Commission. Prior to his untimely passing, Mayor Lee had chosen Yuan Yuan Tan, internationally renowned ballet icon and principal dancer for San Francisco Ballet, to receive San Francisco’s most esteemed cultural distinction. Tan was selected for her creative talents, her local, national and international impact on audiences, and her role as a cultural ambassador for San Francisco. This is the sixth Mayor’s Art Award to be bestowed on a San Francisco artist. Previous awardees are: Ruth Asawa (visual art); Alonzo King (dance/choreography); Carlos Santana (music); Rhodessa Jones (theater); Armistead Maupin (literature). This is the first time a dancer (as opposed to a choreographer) is being honored with the prestigious Mayor’s Art Award. At the same event, ArtCare honored Rena Bransten, owner of the Rena Bransten Gallery, in recognition and celebration of her invaluable and generous contributions as a leader in the cultural life of San Francisco over the last 50 years. The ArtCare Lifetime Achievement Award was presented by Meg Spriggs, Chair of the Board for ArtCare. The ArtCare Lifetime Achievement Award is bestowed upon an individual with significant accomplishments in arts and culture philanthropy as well as civic engagement. Previous awardees include: Ruth Braunstein (the first ArtCare Awardee, who spearheaded the creation of ArtCare); Richard L. Greene; Roselyne C. Swig; Diane B. Wilsey; and Steven H. Oliver. The Monday night gathering welcomed a lively mix of some 300 City officials, local developers and cultural leaders all dedicated to sustaining and enriching San Francisco’s arts ecosystem. In addition to the award presentations, ArtCare also conducted a Fund A Need at the event, and exceeded its fundraising goal to support the conservation efforts for the Lucian Labaudt mural frescos at the Beach Chalet. The first Executive Director of ArtCare, Diane Frankel, was also introduced. More information can be found on the event site. On January 26, 2018, San Francisco Mayor Mark Farrell announced Yuan Yuan Tan, internationally renowned ballet icon and principal dancer for San Francisco Ballet, as the 2018 Mayor’s Art Award recipient. Prior to his untimely passing, Mayor Edwin M. Lee had singled out Tan to receive San Francisco’s most esteemed cultural distinction. Read full press release. Ms. Tan will receive the 2018 Mayor’s Art Award on Monday, April 9 at a benefit reception hosted by ArtCare: Friends of the San Francisco Arts Commission, in conjunction with the presentation of the ArtCare Lifetime Achievement Award to Rena Bransten. Read recent Chronicle coverage here. It is with gratitude and a full heart that we invite you to honor the lifework of the legendary Ruth Braunstein by supporting the 2016 Founder’s Fund Drive. In memory of Ruth, we are formally establishing a fund in her name, the Ruth Braunstein ArtCare Founder’s Fund, to be dedicated to the Restoration and Maintenance of San Francisco Arts Commission’s (SFAC) public artworks. ArtCare has become an increasingly important aspect in the health of the arts in San Francisco. Ruth deeply appreciated knowing that her friends, clients and arts community alike have been instrumental in support of this organization so dear to her heart. With this sentiment in mind, we ask you to consider a gift to the newly established Ruth Braunstein ArtCare Founder’s Fund. ArtCare supports and promotes the San Francisco Arts Commission public and civic art programs in conjunction with the Mayor, the Director of Cultural Affairs, and the Arts Commissioners.